WOODBRIDGE, Connecticut — The first items Faisal Saleh, a Palestinian emigre in the United States, wants you to see on a tour of his new museum on Palestinian history and culture are three personal documents located in the large photography hall in the entrance: an identity card from the early 1940s, a Mandatory Palestine passport from the same period and a small account ledger, with entries for expenses, payments and income recorded painstakingly in dense script. At first glance, these three items, seem almost insignificant, containing nothing to justify their central position in a museum or Saleh’s insistence on beginning a tour with them. These documents neither belonged to an important personage nor originated in the distant past. Their likes can presumably be found in the homes of many Palestinians living in Israel or beyond. But to Saleh, whose late father was the owner of the documents, their importance seemingly lie in their very triviality, in their ability to provide a slightly different perspective on the Palestinian people. 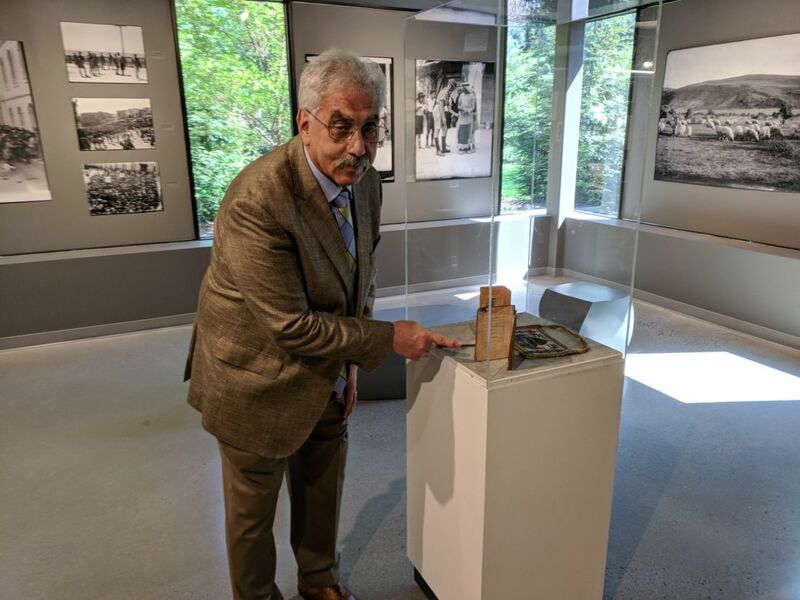 Saleh is the visionary behind the establishment of Palestine Musuem US, which opened in this comfortable suburb of New Haven in late April. You won’t find tanks or photos of roadblocks in the museum. “To learn about the current Palestinian struggle on the ground, turn on the TV,” says Saleh, who hasn’t returned to the West Bank for 20 years. If the ledger and the ID card were meant to undermine the Zionist narrative as Saleh describes it, then the passport is intended as a challenge to the Arab neighbors. “The passport has 32 pages filled with stamps that attest to my father’s frequent trips to Jordan, Egypt, Lebanon and Syria,” he says. “He was raised in Salama [outside Jaffa] and belonged to a paramilitary organization that tried to enlist the aid of the neighboring states in the war against Jewish settlers in the period leading to May 1948. He traveled to request assistance from the Arab leaders who time after time had promised to help and didn’t lift a finger. Instead of supplying arms to the Palestinians, they told them to go back to his village and they’d take care of them, but they were all corrupt and they did nothing,” he adds, clearly frustrated. The personal pain and sense of insult that Saleh’s voice betrays are surprising. He admits having maintained an emotional and geographical distance from the Israeli-Palestinian conflict his entire life. So decisive was the break that since leaving home in 1974 he has returned only once, for a brief visit in 1999. He came as an ordinary tourist, more or less. 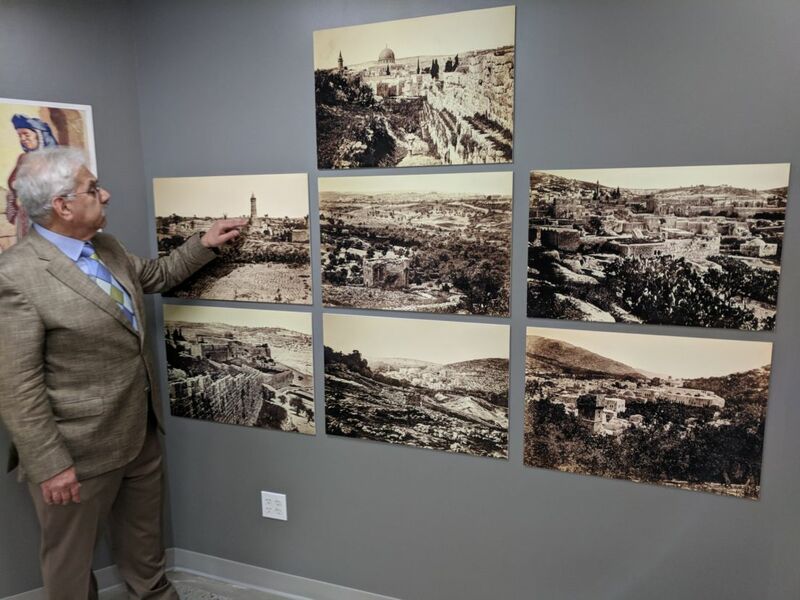 He brought his wife and their two children to see a little of Jerusalem, a little of Bethlehem, focusing on the religious sites, before returning to their comfortable life in Connecticut. Saleh’s parents left Salama during Israel’s War of Independence, eventually settling in the West Bank town of El Bireh, near Ramallah. There, he relates, the family crowded into a single, small room. Saleh, the 11th child in the family, was born three years later, in 1951. “The big question from my perspective is why the parents of 10 children who are crammed into one room without money for food would bring another child into the world,” Saleh says jokingly. Over the years the family settled into a more spacious apartment. His father, who had been a successful farmer before the war, found work at the Red Cross and later in the offices of the Jordanian governor. Some of Saleh’s older brothers looked for employment opportunities elsewhere, eventually finding work in Kuwait. Saleh also searched for a place to go. At the age of 18, two years after the Six-Day War, he moved to the United States, where he was accepted into a program at a private school. From there he moved to a college in Ohio, where he married a local girl, found work and established a thriving business. He blended into the New Haven community, one of the most established and affluent regions on the East Coast if not the United States. He had exchanged Bir Zeit University, close to where he’d grown up, for Yale University, where this interview was conducted. Middle Eastern food had been replaced by soup from the kosher Katz Deli, located a few hundred yards down the street. “At some point my parents moved to Kuwait, following my brothers, so that there was no reason to visit the area” he says, admitting that until recently he had shown almost no interest in the Palestinian struggle for independence. He worked in insurance and set up a technology company dealing with employee benefits. He sold the company in 2010, continuing to work as a consultant for it. Chance sucked him into a topic that he’d tried to suppress his entire adult life. There is also a big wall devoted to photographs taken by European tourists in mid-19th century Jerusalem, as well as one devoted to Rachel Corrie, the American activist killed in 2003 by an Israeli bulldozer as she was protesting the demolition of houses near the Gaza Strip. Her portrait can be seen above a bed of flowers, with an Israeli bulldozer moving towards her in the background. Saleh says that Corrie’s parents attended the museum’s opening last month. In a token act of sympathy, he presented them during the ceremony with a dollar bill, the amount of compensation the family has sought in the lawsuit they filed against Israel, which they demand take responsibility for her death. There is also a large collage of photos, taken by Prof. Margaret Olin of Yale University. It shows graffiti from the Deheisheh refugee camp in the West Bank. Elsewhere, there is an Israeli army ammunition box filled with stones, “showing the asymmetry in the struggle between the two sides”, according to Saleh. “On one side Palestinian children throw stones at Israeli soldiers; on the other, Israeli soldiers shoot bullets at them,” he says. 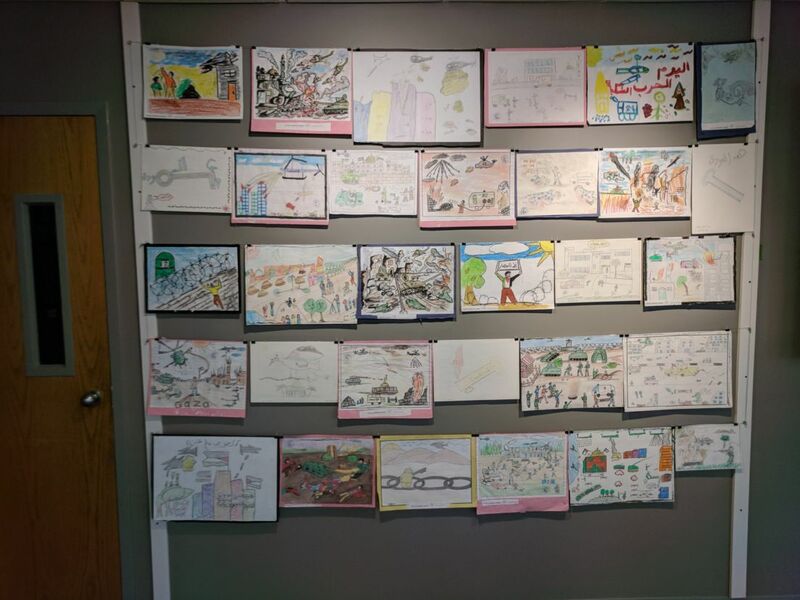 One of the museum’s walls is dedicated to showing the life of the Palestinian community under the British Mandate. The photos show themes that repeat themselves in different versions. In one photo, a British policeman questions Palestinians at the entrance to Jerusalem’s Jaffa Gate. In another, a man is asked to show identification papers in the middle of a street. There are also photos from 1933 in which British soldiers are shown violently suppressing a Palestinian demonstration against the British Mandate and Jewish immigration to Mandate territory. “Back then they were doing what Israeli soldiers are doing these days, only [the British] were much more civilized and less violent,” he adds. And yet, a similar photo of Israeli soldiers detaining Palestinians for a search will not be found in this museum. No photos of an Israeli tank or checkpoint are on display either, or of demolitions or any other sign of the current reality and the Palestinian struggle for independence. Saleh deliberately left them out since, he says, “anyone wishing to learn about the current situation need only turn on his TV or read the paper.” He explains: “There are many ways of learning about the current suffering of the Palestinians and there are many organizations devoted to this. You don’t have to go to a museum to learn about it firsthand. I’m not a political person and I have no interest in copying what’s done elsewhere. He says he sees his museum as an attempt “to help the Palestinian cause in the best and most suitable manner for me, through art, a neutral language that everyone can connect with.It is also meant to foster understanding between Jews, Christians and Muslims, not to be a platform for political debates. He has mainly good relations with the adjacent Jewish community, he says. 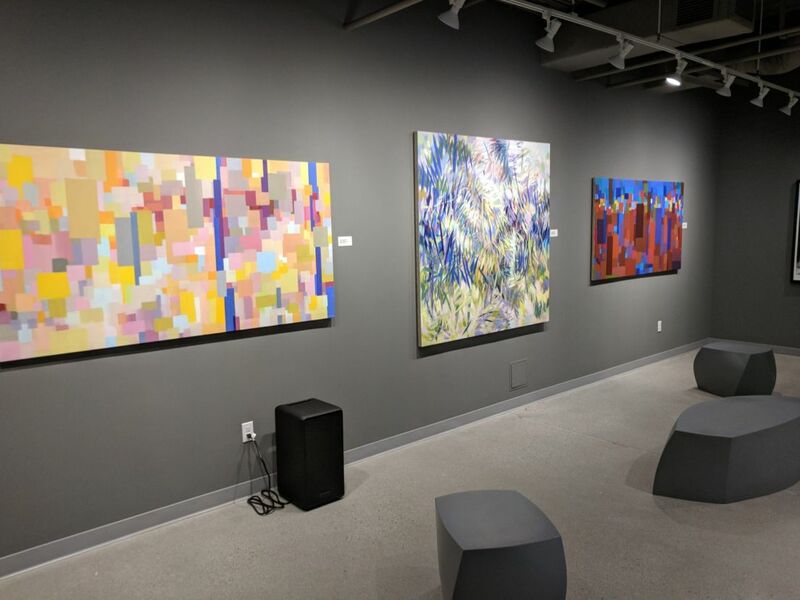 “Several media outlets that came to cover the museum’s opening subsequently interviewed the Jewish Federation in New Haven, which had nothing negative to say,” he says with satisfaction. With that, despite the invitation he extended, none of them have yet come for a visit. Both sides realize that such a visit will not take place in the near future. Palestinians are also not coming in droves, for now. “Some museum visitors came especially from Boston or traveled for several hours from New Jersey and Pennsylvania” he says. But he realizes that as long as the museum remains in an office building in a sleepy town in south Connecticut, far from the lively art and media centers in major cities such as New York or Philadelphia he is fated to remain at the margins of public discourse.